This project focuses on the development of a fundamental framework for employing approximation techniques to reduce computationally expensive subsystems of driving simulation. In order to produce an economical and efficient driving simulator, it is essential to have a real-time driving simulation to guarantee the efficiency of the system. When the cost is one of the main issues in developing a driving simulator, achieving real-time simulation would become challenging and it often leads to intensive computational burden. In this project, a surrogate-based vehicle dynamic model was constructed and used in place of conventional vehicle dynamic model to decrease the computational cost in a driving simulator. 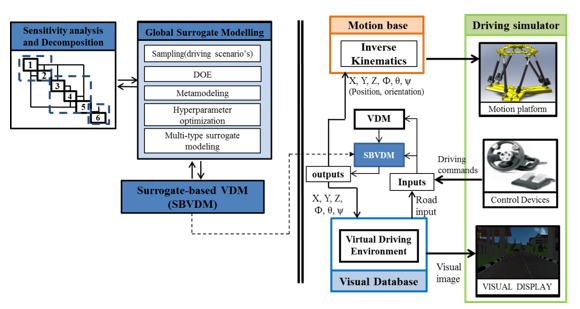 Approximation techniques, sensitivity analysis, decomposition and sampling techniques were employed to develop a Surrogate-based vehicle dynamic model (SBVDM). The response time of SBVDM is almost four times faster than the conventional simulation. Although hardware cost is lowered in this method, the responses are sufficiently accurate. The framework represented in this research can be a valuable tool in reducing computational cost in other multidisciplinary simulation systems. This project id led by Dr Mohamad Kasim bin Abdul Jalil and funded by MOSTI and MOHE. We have developed an integrated system that combines vehicle dynamic response and driver model. 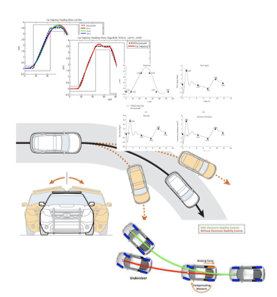 An integrated system that combines vehicle dynamic response and driver model have been developed. This system provides the foundation platform to bring the road safety analysis to the desktop. The main problem of integration of vehicle dynamic response and driver model is the need to have two inputs which are intended trajectory and vehicle motion. With introduction of Cubic Motion curve, the setback can be will solved. The Cubic Motion provides the intended trajectory to the driver model. As a result, steer input can be calculated which becomes the input to dynamic response system. The process continues until all the vertices on the Cubic Motion has been examined. However, the system is limited to 2 Degree of Freedom on 2D environment. This platform should be extended to 3D environment and higher DOF. When the complete system has been developed, its applications can be further researched. One of the application of this system is prediction of the trajectory is resulted of the failure of the car or driver. This project is led by Dr Jamaludin Mohd Taib and funded by MOHE and MOSTI. Failure of large complex engineering systems often leads to catastrophic consequences. 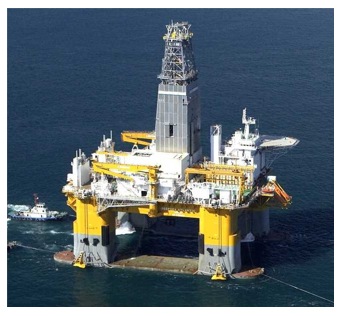 Their efficient and safe design and operation will avoid or reduce malfunctions, failures and accidents. The project is led by Dr Mohd Foad Abdul Hamid and funded by European Commission under the Horizon 2020 Research and Innovation Framework Programme. The aim of the project is to develop and apply knowledge in Reliability and Safety Engineering and Technology (RESET), for safe and reliable design and operation of large maritime (marine and offshore) and other made-to-order (MTO) engineering systems. A series of integrated activities investigates the framework for reliability and safety assessment, system risk and reliability modelling under uncertainties, fluid and structural modelling under uncertain environments, fatigue and fracture assessment, decision making together with case studies, and the development of guidelines for general application of the developed models. Liverpool John Moores University, United Kingdom (Head Research Institution). Gottfried Wilhelm Leibniz Universitaet Hannover, Germany. University of Plymouth, United Kingdom. Wuhan University of Technology, China.